As Lloyds become known for making quality artwork accessible to everyone, we have compiled some reasons as to why investing in the prestigious area of art can be a fantastic investment. 1. Historical Value – Art has been entrenched in human life for thousands of years. From the stone age to the contemporary age, art has been a significant freedom of expression. It has allowed people to begin to understand each other from points of view that would not have been evident without it and provided us with a look at the history of humanity from the beginning of time. 2. Live like the Stars – modern portfolios are showing that those who have the means to invest are doing so and diversifying 5-7% into the art world. Investing in luxury items are becoming the best thing to do with classic investment markets becoming highly volatile. Items such as expensive wines, vintage cars and artwork are now popular due to their less unpredictable markets. 3. Economical Value – the economic recession had us all down. Not many markets did great either, but the art market bounced back with full buoyancy perhaps as the quickest one. Either way, much faster than traditional markets. 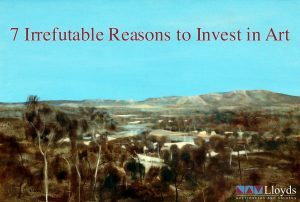 Those with investments in the art were not greatly affected. In comparison to investing in stocks or bonds, art delivers investors with a substitute, palpable opportunity. 4. YOU OWN IT – not the government, not your parents or your partner – you. This is a tangible investment object that does not have the government involved in any way. Therefore, your resale – if you so choose to, will be quick and efficient. Unlike real estate, there are no causal financial markets that will interfere with the price. You will look after your investment and will be responsible for its outcome. 5. It becomes part of your history – buying a piece of artwork is not just a retail purchase. It is something that will be on display for you and whoever is part of your family or walks into your home. Therefore, the piece will ingrain itself into your story as well as have its own. 6. You are engaging in someone else’s life story – contemporary art is known for its unique and beautiful take on the world. This comes directly from the artist and the way they connect to their surrounding environment and relative world. It paints a picture (no pun intended) of their views and what they wanted to creatively output onto the canvas. 7. It’s a simple investment – art is a look back at our past. It can bring up emotional attachment and it can also explore parts of history that we weren’t aware of. It’s something that can be enjoyed and appreciated just by viewing. For these reasons, it will most likely increase in value simply due to its age. Like fine wine and classic cars (both also available in our auctions) art will only become more valuable – whether that is through monetary value or expressive value. …And we’ll give you a free 8th reason. Our next art auction held on the 30th of May 2017 will be supporting charity with all vendor proceeds going directly to Save the Children Australia, which endorses children’s rights, and delivers relief and support in developing countries. Bid now to start investing in art and help build a child’s future. Learn more about art here.